GENEVA, ILLINOIS —Chicago Steel playoff tickets will go on sale beginning Monday, April 8, the team announced today along with a special ticket promotion to benefit area non-profits. For the first two playoff home games, the Steel are offering a special “Buy One, Get One, Give One” offer for tickets purchased through April 14. Any fan who purchases a White ($15) or Red ($10) Zone ticket for either of the team’s first two home games will receive a free ticket of equal value for the same game. In addition, the Steel will give a ticket to a local area charity for a game next season. Fans can take advantage of the special offer by calling 855-51-STEEL or visiting the team’s website, ChicagoSteelHockeyTeam.com and entering promo code “Playoffs” when purchasing tickets. While the team’s playoff position is still up in the air with four regular season games remaining, the Steel announced potential home playoff dates should the team finished second, third or fourth in the Eastern Conference. If the Steel are the #2 seed in the Eastern Conference, they will start the postseason in the Eastern Conference Semifinals hosting Games 1 and 2. Game 1: Saturday, April 20 at 7:05 p.m.
Game 2: Sunday, April 21 at 5:05 p.m. 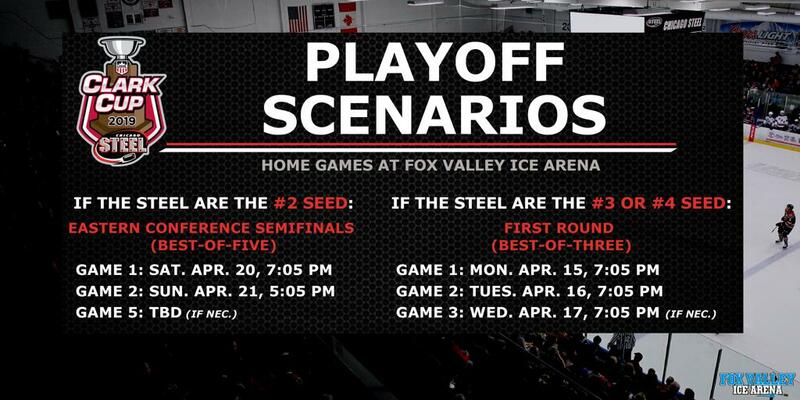 If the Steel finish the season as the #3 or #4 seed in the Eastern Conference, the team will host a best-of-three series First Round series at Fox Valley Ice Arena. Game 1: Monday, April 15 at 7:05 p.m.
Game 2: Tuesday, April 16 at 7:05 p.m. Entering play this weekend, the Steel (34-20-4-0, 72 pts.) are in second place in the Eastern Conference and have a one-point lead on both the Youngstown Phantoms (33-20-1-4, 71 pts.) and Cedar Rapids RoughRiders (33-19-3-2, 71 pts.). Fifth=place Team USA (30-10-2-6, 68 pts.) is just four points behind the Steel. Chicago and Youngstown each have four games remaining while Cedar Rapids and Team USA each have five games yet to play. Starting April 8, fans will be able to purchase tickets to Home Game 1 (tentatively scheduled for Monday, April 15) and Home Game 2 (tentatively scheduled for Tuesday, April 16). If the Steel earn to #2 seed, tickets purchased for Monday, April 15 will automatically be transferred to Saturday, April 20 and tickets purchased for Tuesday, April 16 will automatically be transferred to Sunday, April 21. Additional ticket details will be announced once the seeding is finalized. The Steel also announced that the minimum number of tickets to receive group pricing will be 10 during the Clark Cup Playoffs, though all tickets for the “Buy One, Get One, Give One” offer will only be available at single-game pricing, starting at just $10. Fans still have the opportunity to secure playoff tickets through the team’s March Madness and Pay as We Play programs. With March Madness, any fan that purchases a new Mini-Plan for the 2019-2020 season – starting at just five games for $45 – will receive a free ticket to the final Steel home game of the season (Friday, April 12) as well as the team’s first home playoff game. New 2019-2020 full season ticket holders receive a free ticket to all remaining Steel games, including playoffs, this season. The Pay as We Play program allows fans to lock in the same seat to every home playoff game. Chicago returns to Fox Valley Ice Arena for the regular season home finale on Friday, April 12 for Fan Appreciation Night as the team squares off with the Central Illinois Flying Aces at 7:05 p.m. The Steel are prepared to give away hundreds of items including prizes for Steel goals, silent auction items and much more. Bidding is now available online HERE for the team’s End of Season Jersey Auction featuring game-worn black jerseys from the 2018-2019 season. Bidding will conclude at 12:00 p.m. April 15 and is housed online to ensure all fans have the opportunity to bid on a jersey for future stars of college and NHL hockey. Winners will receive e-mail confirmation at the end of the Steel season with information about when your jersey is available or will be shipped following the conclusion of the team’s playoff run.